In true FIP style, this may be more of a book rant then a review. I found this book before it was released, I pre-ordered it on amazon.com and forgot about it. The book arrived as a surprise. I have to admit I didn’t dig in immediately especially after reading some very bad reviews on goodreads.com —- but you know what they say …never judge a book by its review ….errr or something like that. What a fantastic book! Go buy a copy – DO NOT BORROW OR READ ONLINE. Buy a copy that you can feel, smell and keep. The Opposite of Loneliness is a composition of stories and essays by a Yale undergraduate, Marina Keegan. I personally was blown away at the vastness of Keegan’s experiences at such a young age. I tried to think back to when I was an undergraduate student and not only did my writing not come close to Keegan’s expert penmanship but I also lacked the insight on life displayed by this young lady. Sadly Marina Keegan lost her life in a car accident a few days after graduation. This is a great tragedy and loss to the literary society. And I cry because everything is so beautiful and so short. Every story ends how you wouldn’t expect it to.. every story makes you see things just a little differently. Threw her non fiction, you see her vibrant personality and thoughtful spirit. If the other products of Yale are half as bright as Keegan, I want my kids to go nowhere else. Actually, interesting we come to this point. Before now I’ve never closely known an Ivy League graduate; this may be the closet I’ve gotten inside of an Ivy League brain and man does it tick differently. Not to say there is anything wrong with Rutgers, they’ve produced some awesome folks (I know first hand) but does an Ivy League education really refine one to think outside the box? This one took a little time. Exquistie Corpse screamed Paris! I needed something just as fancy to pair off with the book. Fancy recipe, not so fancy cook. Ha! Check this out, so simple so lovely. For the time being here is a recipe from Manuela, I will be posting pictures from my kitchen soon. 1. 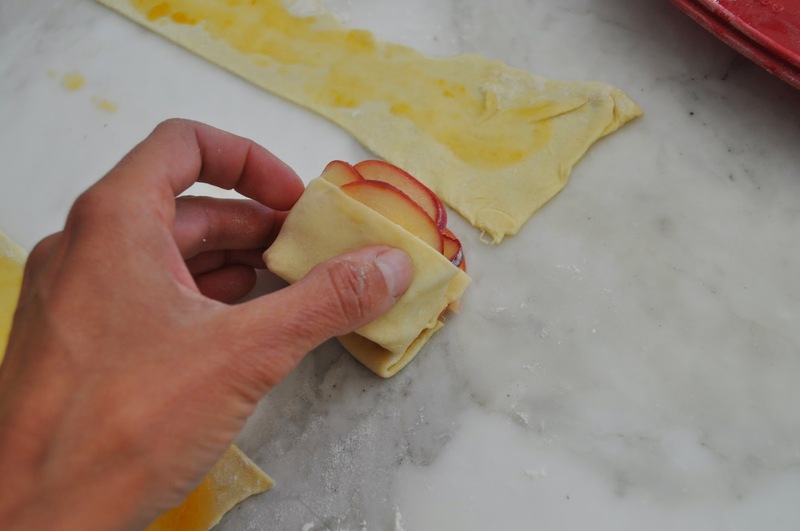 Thaw the puff pastry if you haven’t done so yet. It should take about 20-30 minutes. 2. Prepare a bowl with some water and the lemon juice. 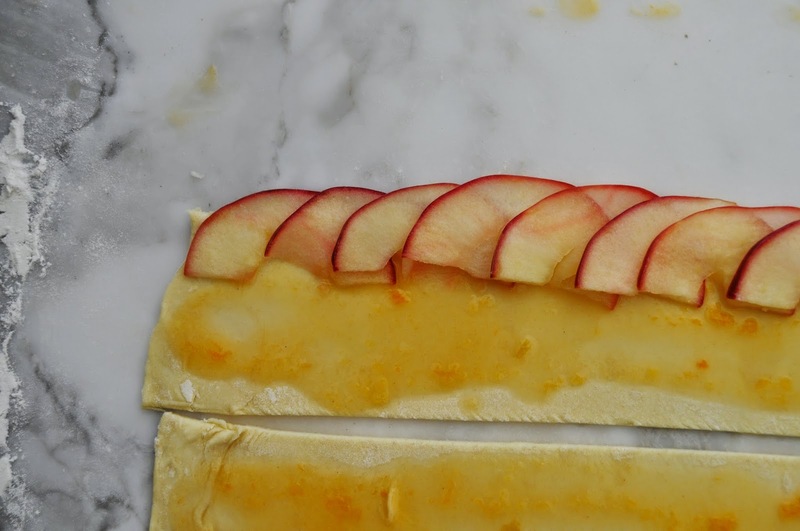 Cut the apples in half, remove the core and cut the apples in paper thin slices, as shown in my picture. 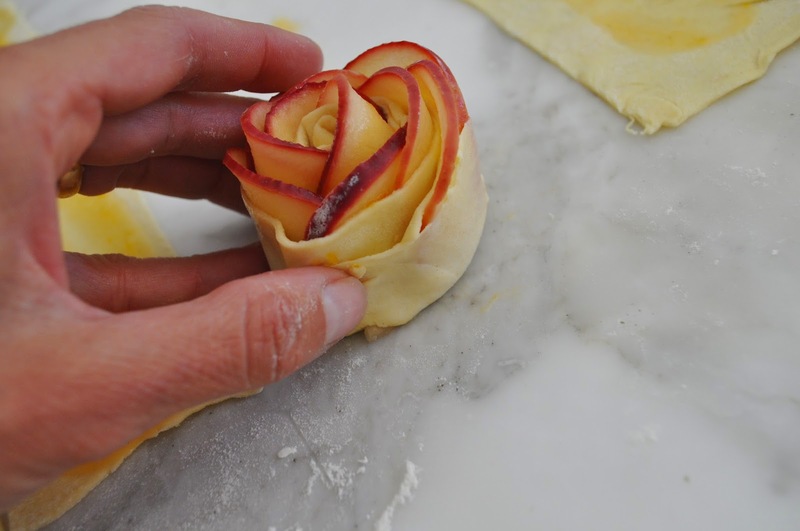 Leave the peel so it will give the red color to your roses. Right away, place the sliced apples in the bowl with lemon and water, so that they won’t change color. 3. Microwave the apples in the bowl, for about 3 minutes, to make them slightly softer. If you prefer, you can also simmer the apple slices in the water in a small pan (on the stove). 4. Unwrap the puff pastry over a clean and lightly floured counter. Using a rolling pin stretch the dough a little, trying to keep it in a rectangular shape. Cut the dough in 6 strips. These are about 2 in x 9 in (5 cm x 22 cm). 5. In a bowl, place three tablespoons of apricot preserve with two tablespoons of water. Microwave for about one minute, so that the preserve will be easier to spread. Spread the preserve on the dough. 6. Preheat the oven to 375 degrees F (190 degrees C). Drain the apples. 7. Place the apples on the dough, as shown in my picture. Sprinkle with cinnamon if you’d like. 9. 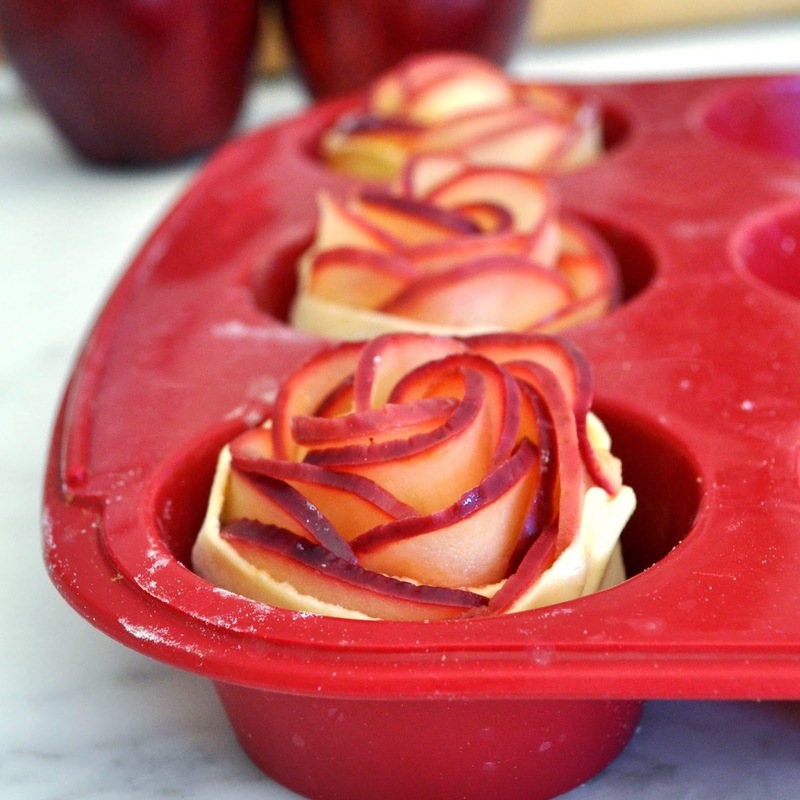 Carefully roll, seal the edge, and place in a silicone muffin cup. No need to grease the muffin mold if it’s silicone. Otherwise, make sure to grease it. 10. Do the same for all 6 roses. Bake at 375 degrees F (190 degrees C) for about 40-45 minutes, until fully cooked. 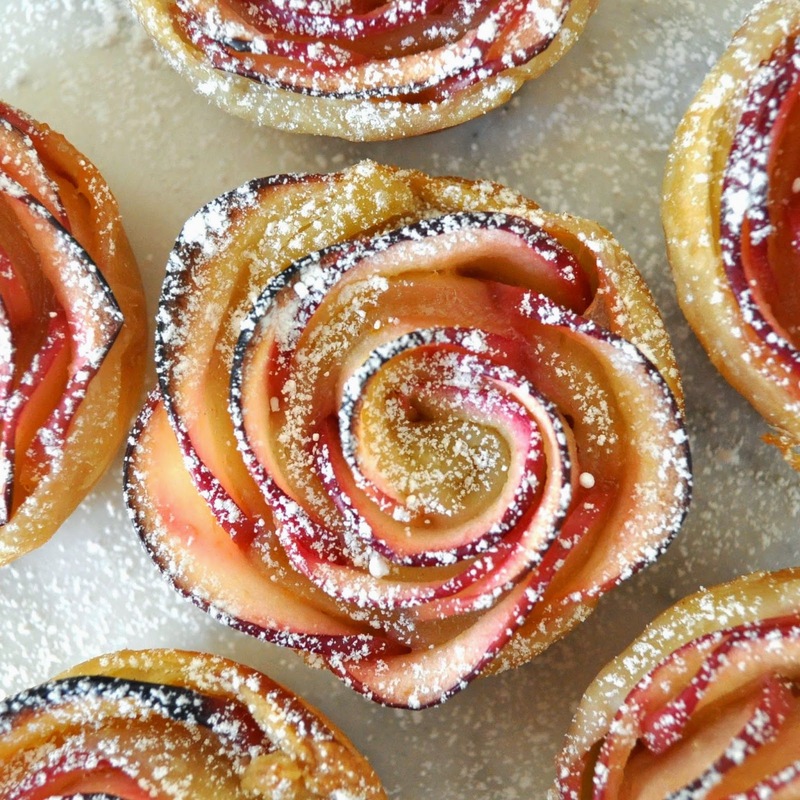 NOTE: make sure the pastry is fully cooked on the inside before removing the roses from the oven! 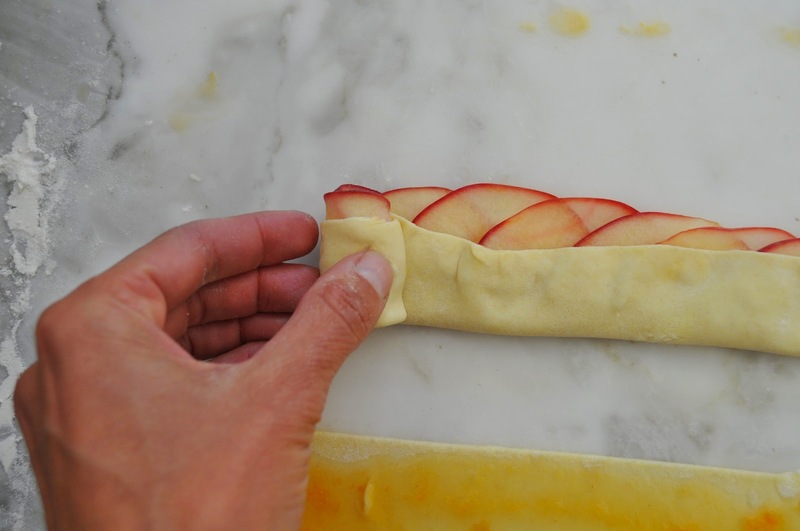 If after 30 minutes the apples on top look fully cooked, move the pan to a lower rack in the oven, and wait for 10-15 more minutes to avoid undercooking the puff pastry. There is a drought on the reading end. I’ve become one of those people who read multiple books at once. I never understood that … until now. The first is The Opposite of Loniless; I am enjoying this book quite a bit but find it heavy and dark. I can’t digest this in such large quantities, I need breaks in between. I do want to finish and write about the book soon though. The other is Deborah Harnkess’ The Book of Life, it’s the last part of a trilogy. OMGGGGG it drags; and I actually need to jot down a character map to keep up with who is whose mama. The author is true novelist and it would be an injustice not complete the series, but this is definitely not my usual taste. I didn’t pick this book, it picked me. A friend of a friend picked up the first book at an airport while she was traveling – told her friend it was really good. I bought it for my friend who said I should read it first because she was riding the waves of Game of Throne glory. I did read it — and like my true self I must finish what I started. w hanging? Have you guys every abandoned a book midway?